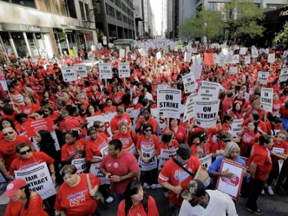 Why The Chicago Teachers Union Strike Was Won!
. . . The Emergence of social initiatives by a revitalized labor movement would be taking place as Negros are placing economic issues on the highest agenda. The coalition of an energized section of labor, Negroes, unemployed, and welfare recipients may be the source of power that reshapes economic relationships and ushers in a breakthrough to a new level of social reform.. . . There is nothing except shortsightedness to prevent us from guaranteeing an annual minimum — and livable — income for every American family. There is nothing but a lack of social vision to prevent us from paying an adequate wage to every American citizen whether he be a hospital worker, laundry worker, maid, or day laborer. There is nothing, except a tragic death wish, to prevent us from reordering our priorities, so that the pursuit of peaces will take precedence over the pursuit of war. There is nothing to keep us from remolding a recalcitrant status quo with bruised hands until we have fashioned it into a true brotherhood.” . . .
. . . The truth is that everything Chicago’s mayor is doing today was set in motion under the regimes of Arne Duncan and his predecessor, and continues around the country with the blessings of President Obama. Four years of action, key appointments and programs speak louder than a few coy words. Everything Rahm Emanuel does to destroy public education in Chicago has the absolute bipartisan backing of Republican Mitt Romney as well as Democrat Barack Obama. And whenever corporate Republicans and corporate Democrats agree on something, it’s bad news for the rest of us. In the end, as Depression-era novelist B. Traven once said, all strikes are against the state. In capitalist society, employers hold all the legal cards. The rest of us are obliged to sell our labor or starve and freeze by the roadside. Workplaces are never democracies, even when your working conditions are our childrens’ learning conditions, even when your employer is the city or the state, the supposed small-democratic public itself. The only power ordinary people have, when they have it at all, is to organize and combine and withhold their labor and their cooperation until somebody comes to the table and promises things will change starting right now. That’s what a strike is — the first and last vestige of real democratic peoples power in action. Whether they know it or not, and many more do than declare it openly, Chicago’s teachers and parents are defending their children and their communities against the coordinated assault on public education, coming from both parties, but mainly from the one in power locally and nationally right now — the Democrats — with Barack Obama large, in charge and carrying the spear for his charter school sugar daddies. The program of Rahm Emanuel, Barak Obama, and the Democratic Party is austerity — nationwide attacks upon the working class, in general, and public workers in particular! The Chicago teachers, through their union, were really fighting Rahm Emanuel, Barak Obama, and the Democratic party and their austerity programs. This strike, basically, was in direct opposition to the Democratic Party austerity policies! The strike was won by the political power demonstrated by the teachers and the communities in the streets! This strike was a victory for the Chicago Teachers Union (CTU) and the community — it points the way for all labor struggles against austerity. Let’s work to make these political demonstrations an example of struggle for all public workers unions, the union movement and the entire working class to build a revitalized labor movement! In the course of this struggle it will be possible to build a “coalition of an energized section of labor, Negroes, unemployed, and welfare recipients (that) maybe the source of power that reshapes economic relationships and ushers in a breakthrough to a new level of social reform” — if we keep fighting, it will lead to the organization of a new political party based upon energized unions that can become a working class political instrument to fight the policies of the Republican and Democratic parties who represent the 1% that own and control the wealth! Yea for the teachers and the community! Yea for Chicago Teachers Union— a ‘reenergized‘ section of the labor movement! The Chicago Teachers Union (CTU) is in a political fight with the Government of Chicago and the Democratic Party. Behind the scenes, this also a fight against their International Union’s policy of ‘partnership with the boss’ and ‘partnership’ with the Democratic Party. A newly elected local leadership has made the Chicago Teachers Strike a fight reaching out to the needs, of not just their membership, but to the needs of all workers and oppressed minorities for quality public education. The above photo demonstrates the mass response of the working class of Chicago. It also demonstrates the political power of the unions in the streets, when they fight for the interests of the entire working class! CTU president Karen Lewis, leader of an internal reform movement that took the union’s top offices in 2010, said the offer from Chicago Public Schools (CPS) did not preserve medical benefits and did not provide adequate job security in a system thrown into turmoil by school closures and charter school openings. CTU also objects to a new system for evaluating teachers that relies heavily on improvement in student test scores. Lewis said the two sides are not far apart on the issue of pay, including compensation for a longer day that CPS imposed this year. Sources differ as to the amounts on the table: Mayor Emanuel said the board offered a 16 percent raise over four years; board president David Vitale described the proposal as 3 percent in the first year, then 2 percent each of three following years; and the CTU characterized neither its latest proposal nor the CPS response. But at its heart, the strike is over the union’s deep opposition to what it calls a “corporate reform agenda” that pursues a competitive or punitive relationship with teachers, rather than a collaborative one. Examples include blaming teachers and unions for educational shortcomings, promoting private but publicly financed charter schools, focusing on high-stakes tests and tying pay to merit. CTU has instead pushed for smaller classes, enriched curriculum, better supplies and facilities, fairer and fuller funding (including the return of some public revenue long diverted into “TIFs” to subsidize developers), more counselors and support staff, respect for teacher professionalism, and a bigger say for teachers in their schools. What is lacking is a Political Party that fights for all workers in unity against the current Obama austerity’s arrows of outrages misfortune and to build such a party to oppose and end them. It is in our own interests to march with the Chicago Teachers Union in their struggle, which is our struggle. They are in a unique position, although they do not the economic strength of an industrial union, they have access to the entire working class, on a daily basis and consequently, the political power to begin to organize, during the course of this struggle, to build an independent working class Party, based upon one person one vote, to finally ‘bail out main street’ and tax the 1%! All Power To The Chicago Teachers Union!